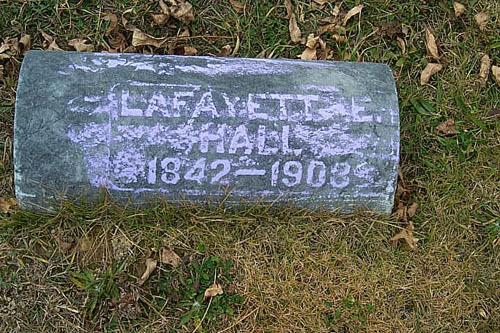 Lafayett E. Hall (b. March 25, 1842) is buried in Brant Township Cemetery in Saginaw Co., Michigan. Verification can be found in Saginaw County Cemeteries, Book Four, page 29, published by the Saginaw Genealogical Society, Inc. Lafayette’s grave can be found in Row 2, Section 2 in Cemetery #1, the oldest section of the cemetery. He is buried in Lot #219. It should be noted that this death certificate is one of the rare instances we have found a written record of his mother, Mercy Steadman, who has remained our brick wall for decades. The only other written trace we have found to date is on the death certificate of Diantha Hall Butler, Lafayett’s older sister. It should also be noted that for research purposes one should trace both Lafayett and Lafayette Hall. His name appears on his death certificate with an “e” at the end of his name, and what we now believe to be his Civil War registration (still being verified) his name also bears an “e” at the end of his name. Researchers should also be aware that his name will sometimes appear with the middle name “Marion”. It is not believed to be correct. His headstone marks his middle name as beginning with an “E”. 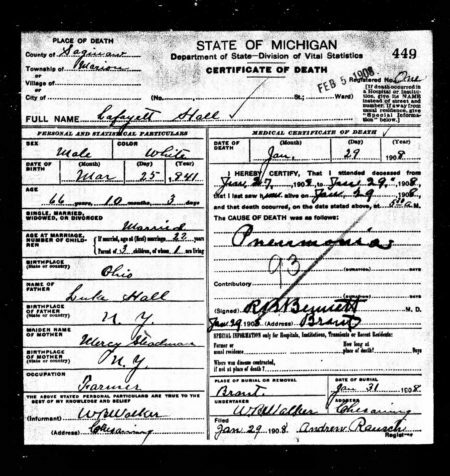 Due to the fact Lafayett once lived in Marion County in Michigan it is highly likely that in old genealogy notes this county name appeared next to Lafayett’s name, and someone interpreted that to be his middle name. Without the benefit of computers such handwritten notes are sometimes misinterpreted by later generations. Longtime researchers who have poured over handwritten deeds and wills will appreciate what I am here saying. Thank you. Established in 1866 and located on section 21-16, on both sides of Brant Road, 1/4 mile east of Brant and Brennan Roads. 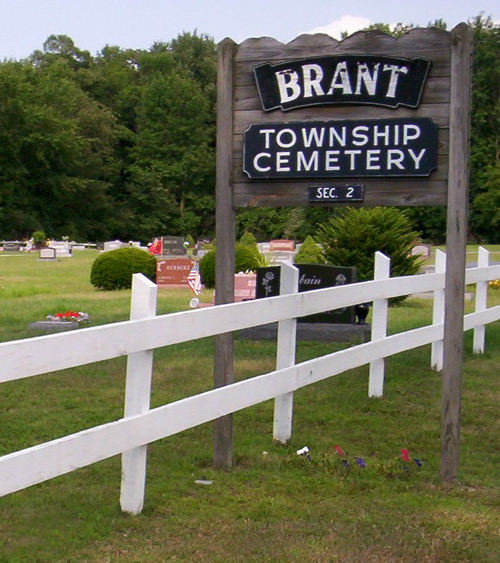 The cemetery is about 7 1/2 acres in size and is owned by the township. The burial records are held by the township clerk. Kathryn, its been a while since I have communicated with you hope all is well. I had a copy of Lafayett Hall’s death certificate but never bothered to look at where he was buried. If you don’t mind I am going to add him to ‘Brant Township Cemetery’. When I go north this spring I’ll make a trip to the cemetery and check.